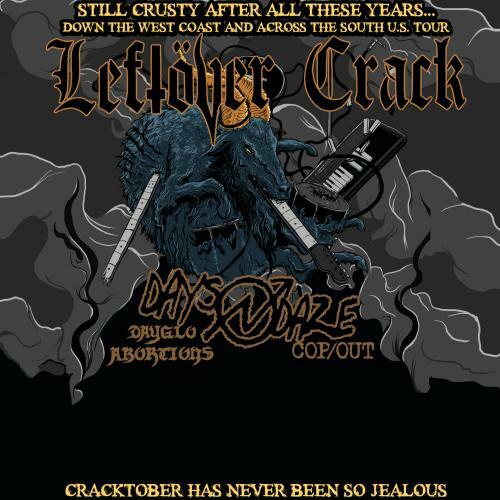 On Thursday, February 14, the Community Center for the Performing Arts and University of Oregon Campus Radio 88.1 FM KWVA proudly welcome Leftöver Crack back to the WOW Hall along with special guests Days N Daze, Dayglo Abortions, Cop/Out and Broken Dead. Leftöver Crack remains one of the more mysterious collectives in the punk rock universe. Fueled by a chaotic mixture of self-medication and an urgent sense of political purpose, this NYC 5-piece has continued to bring the world “That Crack Rock Steady Beat” ever since the demise of the legendary all-squat-all-stars Choking Victim. Leftöver Crack has taken the pulse of a nation in crisis and, after almost a decade of isolation, they’ve resurfaced to spit and scream ‘ME TOO!’ and ‘I TOLD YOU SO!’ directly into America’s cold, sweaty, corrupt face. According to the band, their early days were spent being, "courted, recorded, subsequently censored and held creatively hostage by former punk record label Epitaph.” Since the release of 2001’s Mediocre Generica, and its follow up (2004’s classic F^ck World Trade) we’ve learned we can expect more “Atheist Anthems” and “Crack Rock Steady Beats” from this notorious band -- delivered in all their agitated, offensive, punk as f^ck, clamorous yet danceable dissonance. Leftöver Crack's Fat Wreck Chords release Volume III: Constructs of the State; features a wide array of special guests -- as expected from a punk band equally influenced by Hip-Hop culture as they are by Anarcho-Punk, Crust, Metal and Ska. This record brings some of their most treasured and plagiarized musical/lyrical sources into the studio, including Jesse Michaels of Operation Ivy and Penny Rimbaud. In addition, their friends from such celebrated groups as The Bouncing Souls, Dark Dark Dark and Blackbird Raum inspired them to keep making music and experimenting. LöC has taken their critically serious message concerning the police state, religion, political corruption and lower class suffering far and wide with their often tongue in cheek lyrics and intense albeit wry delivery. The current band features core members Scott “Stza Crack” Sturgeon on vocals and Alec “Shibboleth” Baillie on bass. LöC is now featuring Southern California punk ambassador Brad “Minus” Logan on guitar and more recently became armed with Donny “skillets” Morris on drums and Chris “the man” Mann on guitar. Constructs of the State is the third in a series of thunderous yet melodic cacophony, forever adhering to the band’s core ethics against racism, sexism, trans/homophobia, the police, corporations and fascist subjugation. Leftöver Crack is back to diagnose the symptoms of our failed society and dying world. Beware the wrath of the victim! Days N Daze is a true D.I.Y band through their recording, packaging and promoting their music independently. They are best known for their energetic live shows that bring the audience members to stripping their clothes off in ecstatic, music-induced jubilation. The band has performed throughout the United States and Canada in venues ranging from house shows to festivals. DnD independently booked and promoted a full U.S tour with New Zealand’s Night Gaunts after their split release in 2015. They have toured with Leftöver Crack and are featured on LöC’s newest album Constructs of the State. On the road, DnD has played the D.I.Y. staple Mountain Blood Fest and at Skatopia's Bowl Bash, as well as multiple sold out shows across the United States. At home, they perform routinely at well-regarded spaces such as Walter's and Warehouse Live. Houstonians Whitney Flynn and Jesse Sendejas formed DnD as a duo in 2008 and grew into a full band. Presently, the band's rhythm section includes bassist Geoff Bell and percussionist Meagan Melancon. Flynn and Sendejas remain the band's principal songwriters. The group's sound has been described as "riot folk" or "thrashgrass”. Song themes run the gamut from social problems like gang violence, terrorism and annihilation of the environment for corporate pocket-lining to the mundane and unavoidable anxieties of modern life. In 2016, DnD released their seventh full-length album CrustFall. The band was honored with the award for Best Punk Act in 2015 by The Houston Press. Cop/Out is comprised of four punx committed to DIY in NYC. They met as fellow organizers of the annual fest Punk Island, All are active in different scenes, and joined forces to advance the Queer/Commie Conspiracy one punk tune at a time. The band consists of Al Ghostcat (guitar & vocals) Joey Steel (vocals), Kate Hoos (bass) and John Licari (drums). Tickets are $15 in advance, $18 day of show. Doors open at 6:30 pm and show time is 7:30.